Jeff George began playing tabletop RPGs in the late 1970s. He was an editor and game developer for Steve Jackson Games in the 1980s (GURPS line, Illuminati, and many more), and then a writer and game developer at Origin Systems (Ultima line, Wing Commander Line, and more) into the early 1990s. After a long break, he's found his way home to tabletop gaming through the OSR D&D and downloadable indie RPG scenes. He started PnPG to spread interest in and awareness of papercraft miniatures and PDF games and supplements. In today’s update, I’ll explain why I haven’t posted lately (spoiler: we’re moving to a new home! 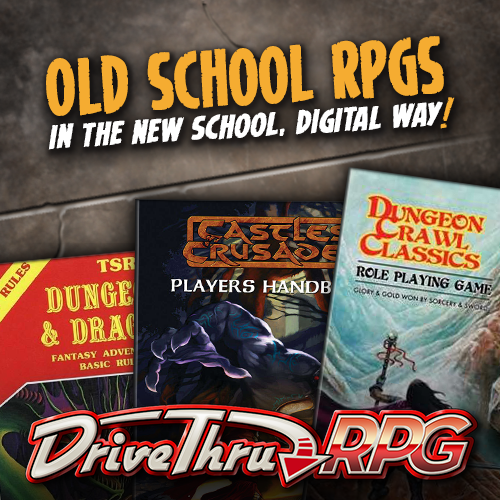 ), tell you about DriveThruRPG’s annual Christmas in July sale, and let you know when to look for that PnPG reader contest I teased last month. In today’s update, I’ll explain why my normal Friday featured post is delayed, and tease printandplaygamer’s first-ever prize giveaway.